Niagara Falls is a stunning natural attraction that many travelers can’t wait to see. Not only is it an incredible example of how nature and landscape collide, it’s a destination packed with things to do and see. Add to that the fact that you can stay right next to the waterfalls in hotels like the Marriott On The Falls, where the view for your room is almost enough to keep you indoors forever, and you have a destination that’s both exciting and relaxing. It’s no wonder so many visitors flock to Niagara Falls each year. As there are so many attractions competing for your attention when planning a trip to Niagara Falls, we wanted to make it easier for your to decide what things to prioritize by giving you a “what not to miss” list. There are numerous tours available that let you experience these majestic waterfalls in a variety of ways. Many require advanced tickets, so make sure to plan ahead. I’m assuming you already know what Niagara Falls is or you wouldn’t be looking to go there. However, you may not know that Niagara Falls is made up of three waterfalls – Horseshoe Falls, Bridal Veil Falls, and American Falls. These three waterfalls span between Canada and the United States. You can approach the falls from either side. That means that if you’re an American you won’t need a passport to visit the falls, and vice versa for the Canadians. You can just stay on your own side. The falls were formed during the melt-off of the last Ice Age (around 12,000 years ago), when the extreme flow of water formed the falls. During the height of summer and fall run-off periods, there are more than 700,000 gallons of water flowing over the falls per second. There are two airports you can fly into within close proximity to Niagara Falls. There’s the Toronto airport on the Canada side, and the Buffalo, NY, airport on the U.S. side. From Toronto airport, the drive to the falls is about a 1.5 hour drive. From Buffalo, the drive is around 30 minutes. I do advise renting a car because it will be so much easier for you to get around, but it’s not entirely necessary. There is a train station in Niagara Falls that you can come into from Toronto, New York, or other close by cities. Once in Niagara Falls, as long as you’re staying within the main tourist area, you can walk or cab to just about everything. Niagara Falls State Park is open 365 days a year. In fact, it never closes. However, some of the attractions do close during the winter period when conditions are poor. Summer months are extremely crowded at the falls and you’ll end up spending more money due to high-season prices. So, we recommend visiting Niagara Falls during the fall or spring, if possible. These are the shoulder months, so you won’t have to fight crowds or overspend on accommodations. 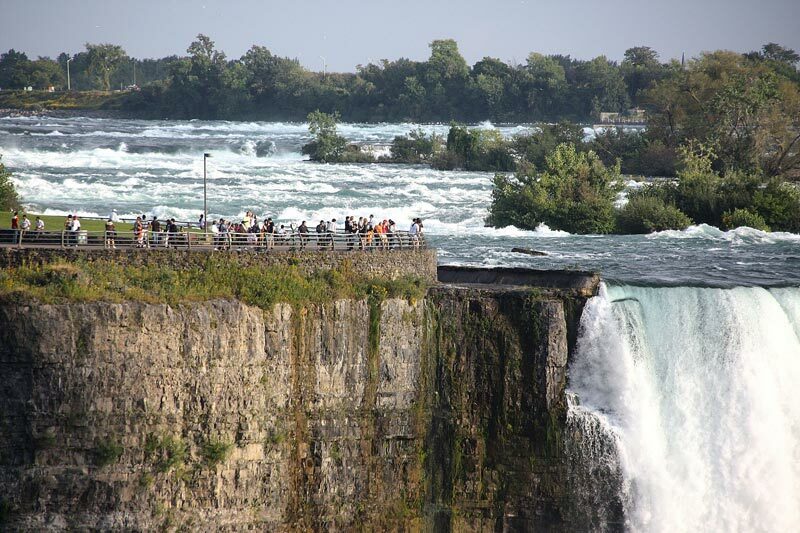 As mentioned, there is a Canada and United States side to the falls. You can stay on either side and there are great hotels and restaurants in both areas. ⇒ Wondering where to eat in Niagara Falls? Check out our foodie guide to Niagara Falls. One of the best ways to see all aspects of the falls without putting in a ton of effort to coordinate everything is to book an organized tour. Here are a few that we recommend. 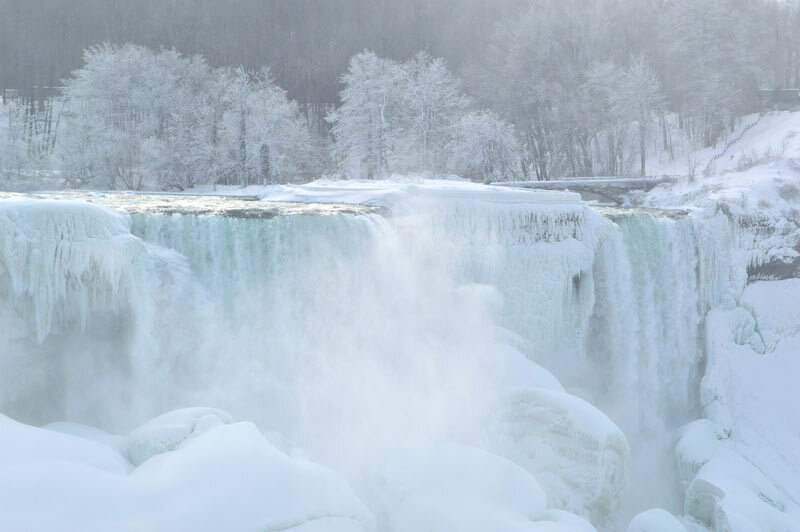 Best of Niagara Falls Tour from Niagara Falls, Ontario – this is a 5-hour comprehensive tour of the Canadian side of Niagara Falls, including a trip up Skylon Tower, the Journey Behind the Falls excursion, and the Hornblower cruise. Niagara Falls American Side Highlights Tour – this 4-hour tour includes Prospect Point Observation Tower, the Maid of the Mist boat tour, and Cave of the Winds on-land tour. You’ll visit Bridal Veil Falls, Horseshoe Falls, Goat Island, and the Mighty Whirlpool. 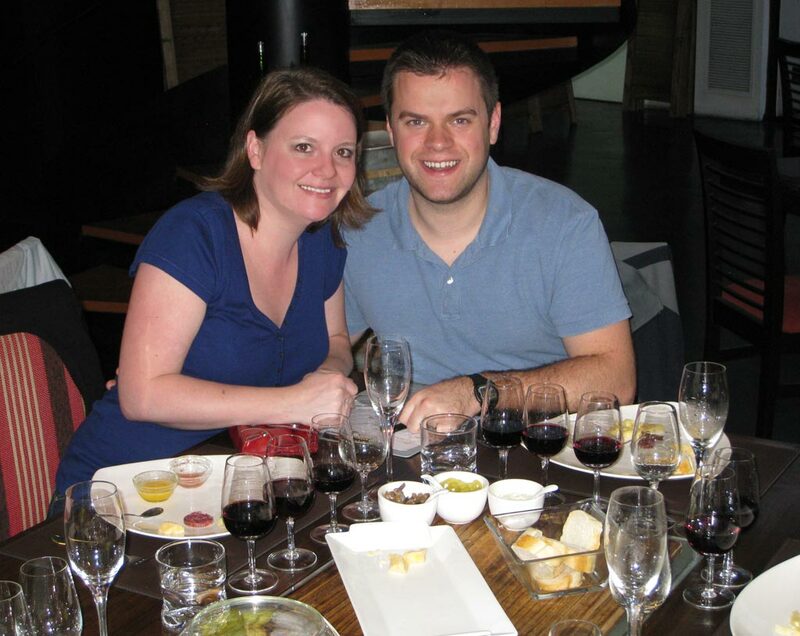 For a change of pace, we also recommend doing a Niagara-on-the-Lake wine tour with lunch. This is a really fun and unique wine region to visit. 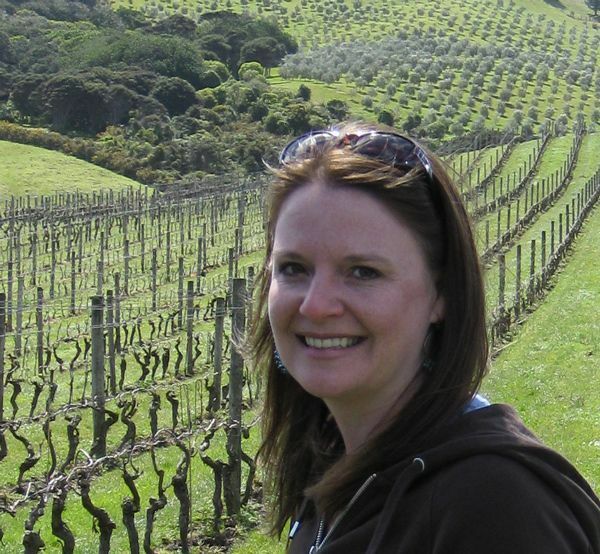 You’ll stop at 5 wineries on this tour, plus lunch. 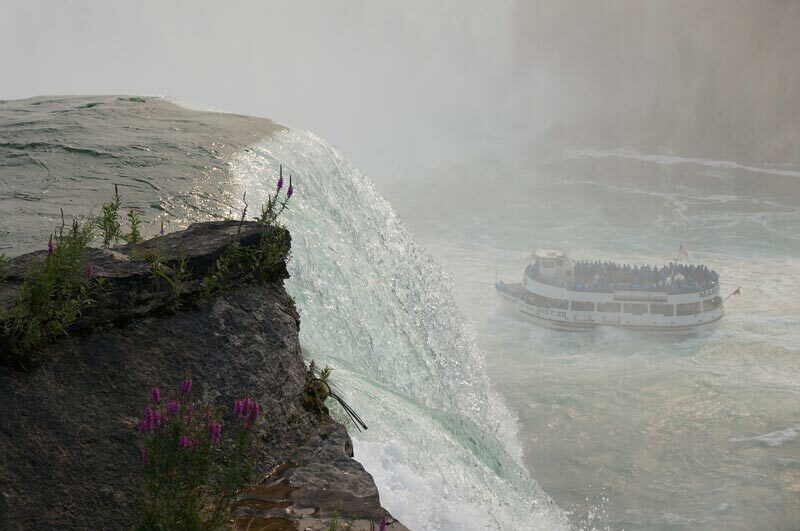 From the Canadian side of the Falls, take the Hornblower Niagara Cruise. It is a great way to enjoy the river, as well as the actual waterfalls. The boat trip takes you up the river past the waterfalls on the American side and into the gorge that contains the spectacular Horseshoe Fall. Once there you get to go within a few feet of all that roaring water. It is a great way to experience the power and the majesty of the falls. At certain times of the year, you can enjoy an illumination or fireworks cruise. Being right next to the Falls when they are lit up by colorful lights really is a memorable experience. If you want to get even closer, take the Journey Behind the Falls tour. During this tour, you take an elevator 150 feet down into 130-year-old tunnels. From there you can walk out onto a observation deck that puts you behind the Horseshoe Falls and it’s raging stream of water falling at over 40 miles per hour. You’ll need to put on your bright yellow poncho to keep from getting soaked from the mist coming off the falls. As you’ve already seen, there are many observation towers and points from which you can get a bird´s eye view of the Falls. Since the Falls are the main attraction, and no doubt the major reason you visited this area, you should see it from as many angles as possible. One of the best is from above, at the Skylon tower, on the Canadian side. At the Skylon Tower Observation Deck (get tickets in advance here), you’ll be 775 feet above the falls. The deck is so high that you can see 8,000 square miles of Canada and the U.S from this vantage point. If you like fine dining you will really enjoy the world-class food that is served in the revolving restaurant. Plus, staying for a meal is a great way to enjoy the view for longer. 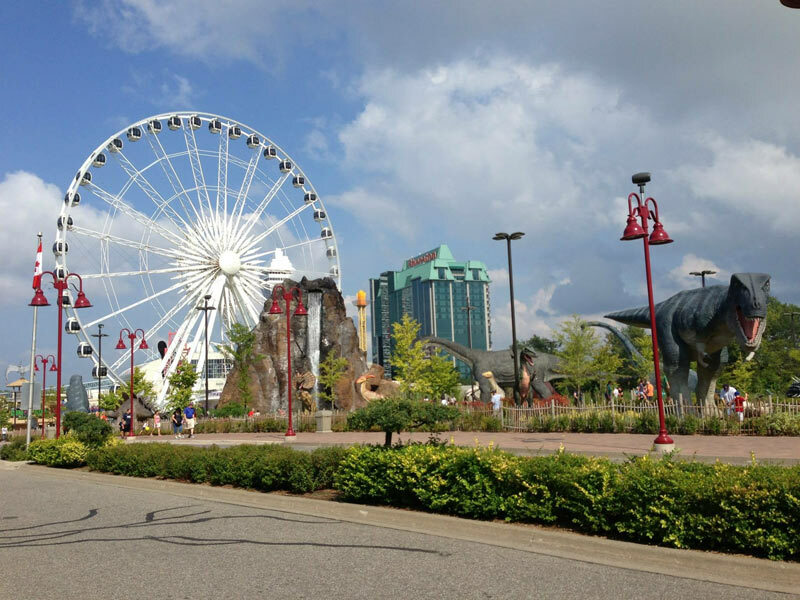 There are a few other attractions to enjoy in the Skylon Tower, including a family fun center, a 3D/4D movie about the falls, and a glass-blowing gallery. If you’ve ever been white water rafting, then you can probably imagine the power and force of Class 6 rapids. Walking alongside the river will give you an up-close view of just how powerful these rapids are. On the White Water Walk, you’ll be able to walk a quarter mile along the boardwalk that follows the base of the gorge. It gives you a unique view of the rock layers that form the gorge, and you can stop off at viewing platforms for an even closer view of the water raging by. Tickets are approximately $12 for adults. Another fascinating way to see the Falls from a different angle is on the Niagara Skywheel. This Ferris wheel glides up to 175-feet over the Clifton Hill area, and offers breathtaking panoramic views of the falls and the city below. From the ride, you’ll glimpse unique views of both the Horseshoe and American Falls. The gondolas are small, built for 2-4 people, and are fully enclosed and air-conditioned. It’s always best to purchase tickets in advance for the ride so you can skip the line. The ride lasts about 10 minutes. Tickets are approximately $12 for adults. The Niagara Skywheel isn’t the only tourist attraction located in Clifton Hill. In fact, this area is one of the busiest, because it’s packed with touristy activities. Whether you’ll want to visit any of them is a matter of personal preference, but you can find things like midway games, a wax museum, a mini-golf course, a 6D theater ride, and tons of touristy chain restaurants. After seeing the Falls for yourself, a visit to the Niagara Falls History Museum is a nice way to follow up and learn more. This museum contains exhibits that tell you about the history of the area, it’s people, geology, and industry, as well as the waterfalls themselves. As you can see, there are many ways to enjoy Niagara Falls from all angles. When planning a trip to Niagara Falls, you can be sure you’ll see it all with these activities. And don’t worry about the views getting old – that’s impossible. What are your favorite ways to see Niagara Falls? We’d love to hear about your experiences in the comments. Want to save this post for later? Pin it to your Pinterest board. This entry was posted in Attractions and tagged Canada, new york, USA.